Hakusan, Japan, August 30, 2016 – EIZO Corporation (TSE:6737) announced the DuraVision FDF4627W-IP, a 46-inch IP decoding monitor for security and surveillance environments. 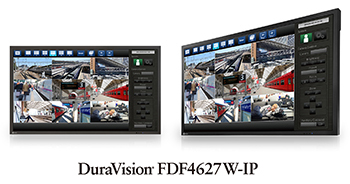 The DuraVision FDF4627W-IP comes equipped with decoding technology that ensures that images are displayed with no delay and are true to the original source data. This eliminates the need for an additional decoder, simplifying the installation area. The VESA mount configuration makes it easy to install the monitor on a wall or ceiling. In addition, the monitor does not require a PC to operate, significantly reducing the time, costs, and labor of installation while also simplifying cable management. Video from up to sixteen separate IP security cameras can be displayed simultaneously across the monitor’s large 46-inch screen. This provides ample space for clearly viewing multiple video feeds at once in security and surveillance environments. Operators can select from five different video layout options to suit their needs. Video layout and camera options are adjustable manually using the included remote control or via a user-friendly web UI for flexible operation. The monitor’s web API supports customized integration with the local VMS. This allows operators to assign a specific response from the monitor to automatically occur whenever a particular event takes place. For example, the monitor can be configured to automatically adjust screen layout when an individual enters the field of view of a connected IP camera. Various monitor and camera options can also be adjusted based on a preset time schedule according to the needs of the user environment. The DuraVision FDF4627W-IP is equipped with EIZO’s Smart Insight visibility-enhancing technology, which automatically detects areas of the screen that are too dark and difficult to see and adjusts the brightness of each pixel. This produces highly visible images by brightening dark areas and keeping light areas from becoming washed out, preserving a realistic sense of depth in the image. It also has Smart Resolution blur-reduction technology which corrects blurred areas without over-accentuating noise for a sharper image. In addition, noise-reduction technology minimizes the amount of block noise that results from video compression. The monitor’s high brightness of 700 cd/m2 and 4000:1 contrast ratio provide exceptional visibility in a variety of security and surveillance environments. The wide dimming range also makes it more comfortable for operators to use the monitor in dim or changing ambient lighting conditions.